GIVE LOCAL - We grow over 25,000 lavender plants, harvest them by hand, distill the essential oil, hang the bundles for drying and strip the buds off the stems — all on our San Juan Island farm. GIVE ORGANIC - We use only our own organically certified lavender essential oils and flowers in our products. GIVE HANDCRAFTED - All Pelindaba Lavender products are handcrafted by local artisans. When we say handcrafted, we really mean it! All the ingredients are assembled or blended by hand, products are all labeled by hand, and every one of the tiny bows are tied by hand! GIVE LAVENDER - With the widest range of farm-based lavender products we know of anywhere, we have the perfect lavender gift for everyone on your list. Here are some suggestions... 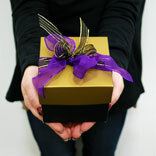 Lavender Gifts for Her, Lavender Culinary Gifts, Organic Lavender Gifts and lots of Stocking Stuffers under $10!